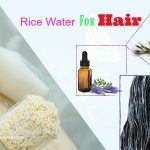 For people who are the big fan of natural oils and foods for beauty and health, coconut oil is an indispensable ingredient. 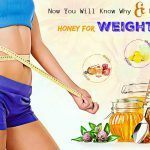 It is a delicious supplement that brings us a lot of health benefits such as boosting the immune system, aiding weight loss, prevent digestive diseases, etc. Besides, it is good at skin care and treating skin diseases. 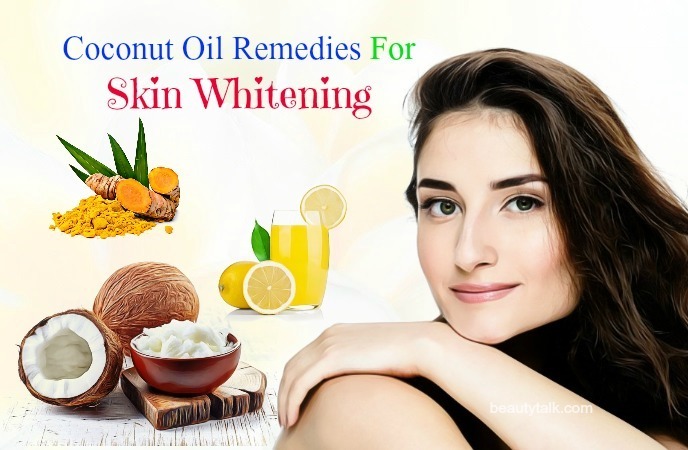 Our today’s article will show you the best uses and benefits of coconut oil on skin issues on face, body, and hands including skin whitening, eczema, dry skin, stretch marks, sunburn, skin rashes, and skin tags. However, firstly, let have a look at what the benefits of coconut oil on skin are to understand more about this magic oil. I. What Are The Benefits Of Coconut Oil On Skin? Coconut oil is extracted from the meat of mature coconut fruits. One tablespoon of coconut oil contains 117 calories and 13.6 grams of fat. Moreover, 50 percent of fat in coconut oil is lauric acid, which can be converted into monolaurin – a substance with antibacterial and antiviral properties. Therefore, it helps remove bacteria and virus inhabiting in your skin. Coconut oil is also rich in monoglycerides and medium-chain fatty acids, which are also found in breast milk. 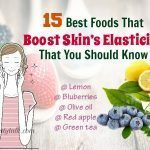 These good acids will destroy the structure of microbes and make them less active; thereby, prevent the inflammation and infectious skin diseases. Coconut oil can help to reduce stretch marks very effectively. With the moisturizing properties, coconut oil can easily penetrate into the skin and nourish it. 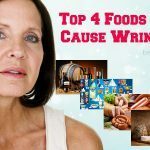 Also, it is rich in oxidants, which can protect your skin from the damage of free radicals – one of the leading causes of stretch marks. Thanks to the antibacterial and antifungal properties, coconut oil can help to clean your face naturally. 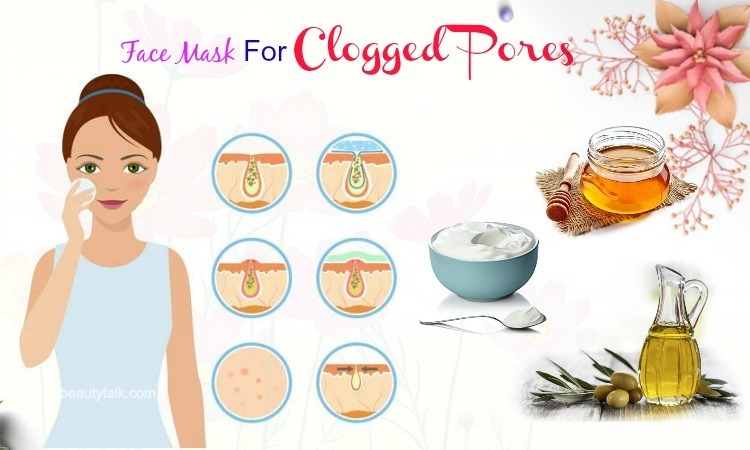 It will aid in removing dust and impurities from your skin surface and prevent the risk of acne and pimple. If you have psoriasis on your face, apply coconut oil face masks. 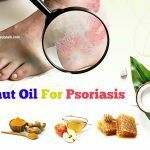 For psoriasis on the body, take a bath with coconut oil. It will help to reduce the redness and relieve the pain and itchiness. Not only nourishing facial skin, but coconut oil is also able to treat dry skin on the hands and body. It helps prevent the dehydration but boost the wound healing process. Therefore, the remedies with coconut oil are considered to be perfect for dry skin during the winter. There are many reasons that cause dark skin such as sun exposure, chemicals, meditation, poor diet, harmful environmental elements, etc. For these problems, applying coconut oil face mask is considered one of the most effective methods. This oil is a rich source of vitamin E and antioxidants, which help prevent the damage of free radicals and promote the production of collagen. Also, the fatty acids available in this oil help moisturize, nourish and brighten your skin effectively. Coconut oil has anti-inflammatory and anti-fungal properties, so it helps fight bacteria that cause infection on the skin. Apply this remedy every night before going to bed to get the best result. Finally, apply some sunscreen lotion before going out. Apply this remedy every day to whiten your skin fast. Daily repeat this remedy to achieve the desired result. 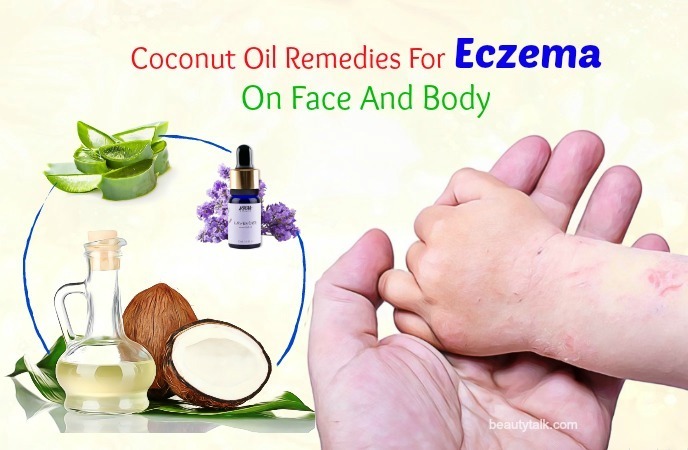 Apply this remedy twice per days to get rid of eczema soon. Finally, apply the mixture every day after showering. Follow these directions every day. 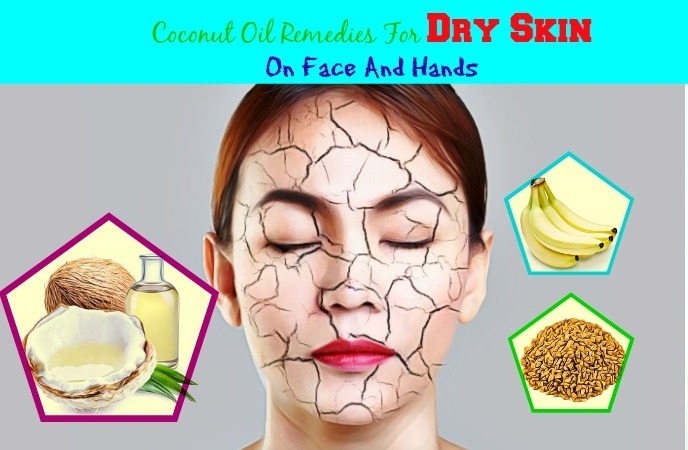 Treating dry skin is one of the most overwhelming benefits of coconut oil on skin. Thanks to the moisturizing properties, it helps to lock the natural moisture of your skin. The healthy fatty acids in coconut oil are also beneficial to your skin. Together with vitamin C and E, fatty acids will absorb into your skin and nourish it. Using coconut oil regularly not only helps you treat dry skin but also brings about beautiful and glowing skin. 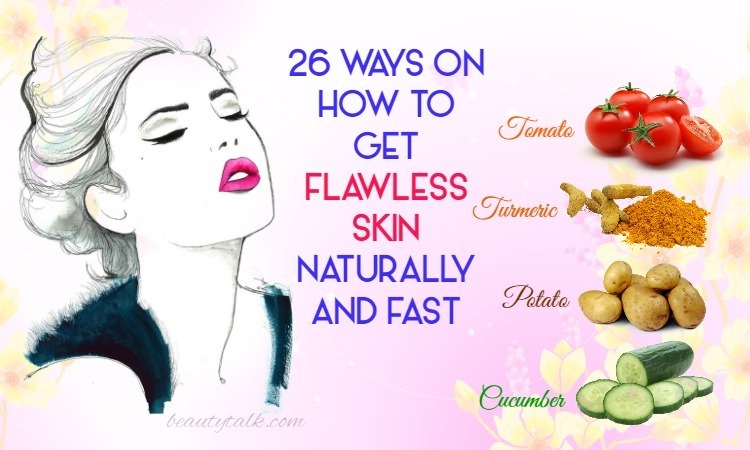 Repeat these directions every 3 days to nourish your skin well. Banana has anti-wrinkles and moisturizing properties, so it helps to soothe dry skin and prevent smile lines. Apply this remedy every week or twice a week to keep away from dry skin soon. It is better to use this remedy every 3 days. Thanks to the monosaturated fats, coconut oil can help reduce stretch marks and healing scars. The antioxidants in coconut oil will protect your skin from free radicals, while vitamin E and K help delay wrinkles and aging signs. Using coconut oil will relieve the irritation during pregnancy. Also, this oil encourages the production of new cells to ensure healthy and beautiful skin. Do this remedy every day to remove stretch marks fast and safety. 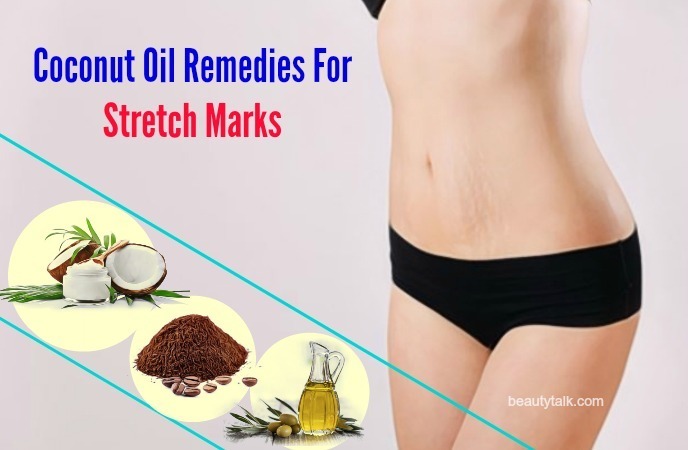 Do this remedy twice per day to remove stretch marks thoroughly. Follow these directions every 2 days. 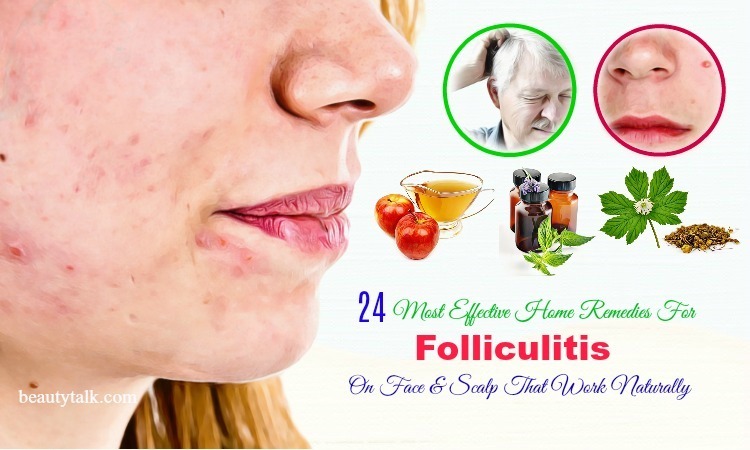 Apply this remedy once a day to treat this skin issue effectively. Coconut is a natural ingredient that contributes a lot to protect your skin from sun exposure. 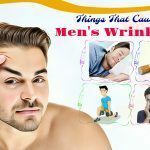 Mainly, coconut oil helps improve the elasticity of your skin and prevent the formation of wrinkles and sunspots thanks to the antioxidant properties. The lauric acid and capric acid in coconut oil play an important role in treating sunburn, especially itchy skin. Furthermore, thanks to the rich content of vitamin E, coconut oil is useful in combating oxidative stress, which can lead to skin cancer and many other dangerous diseases. Here are the directions to help you make use of the benefits of coconut oil on skin. 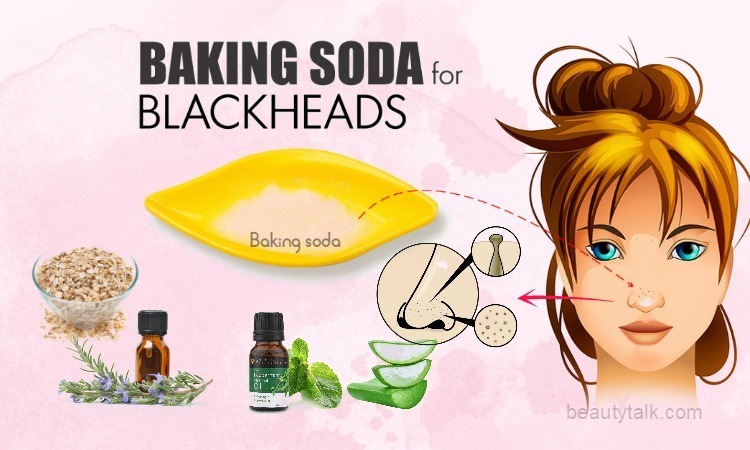 Regularly use this remedy to protect your skin well. 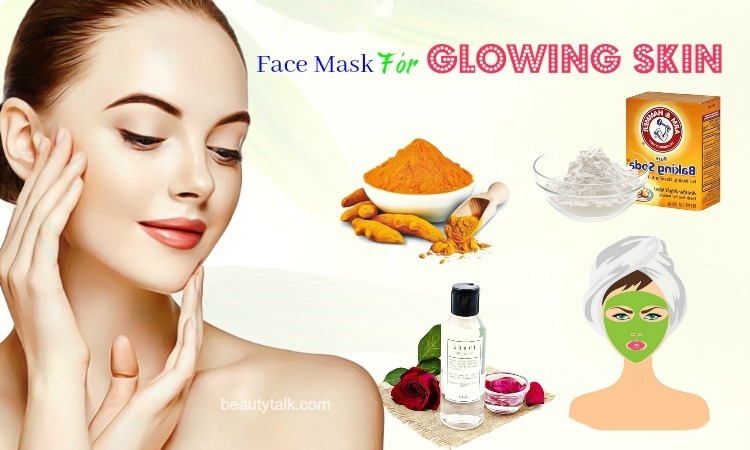 Finally, apply the mixture to your skin whenever you have to go out. 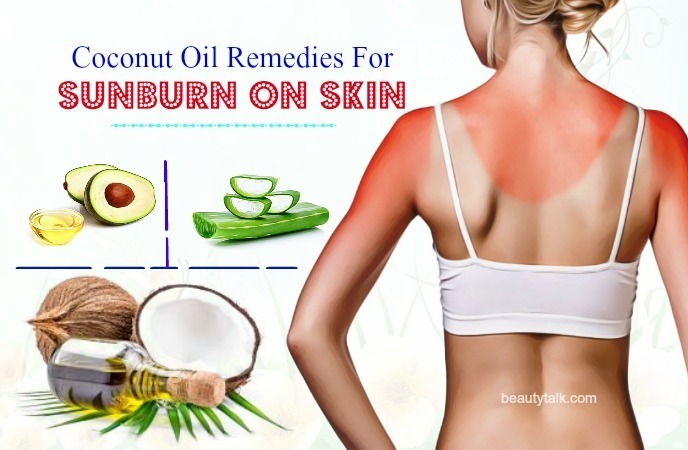 Coconut oil is a useful ingredient for skin rash treatment. The antioxidants and fatty acids in this oil will absorb into your skin and treat the skin rashes effectively. It helps to soothe the pain, bumps, itchiness, and redness very quickly. This oil is also safe for skin rashes in babies. Therefore, you do not need to worry about its side effects or allergic reactions. To eat more coconut oil for skin rash treatment purpose, you can easily add it to your dishes while you are cooking. A teaspoon of coconut oil will make your coffee or green tea more delicious. Also, if you are a big fan of salad, add coconut oil to this dish and enjoy. Coconut oil contains lauric acid and has antibacterial properties, so it helps to remove bacteria, viruses, and fungi, which cause skin tags. Also, this oil is rich in alpha-tocopherol – a substance that removes skin tags after a few weeks only. Repeat this remedy twice or thrice per day to achieve the desired result. Mix coconut oil with lavender oil and then apply to the affected skin area. This remedy will help soothe the red and itchy skin. Besides the excellent benefits for health and beauty, coconut oil can still cause some severe effects if you do not use it correctly. 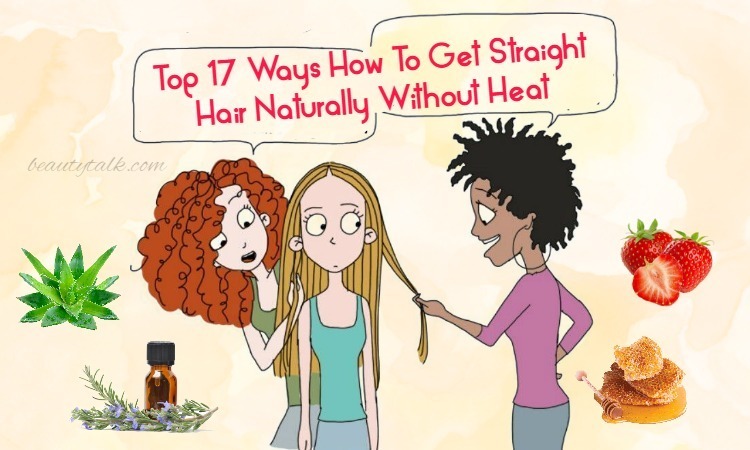 Here are some tips and precautions for you when using this oil. A little bit of coconut oil in salad or dishes can help to treat skin rash; however, if you consume too much, it can cause diarrhea. It appears that coconut oil can cause allergies in people with sensitive skin. Coconut oil can cause acne in some people. Although coconut oil is still used to treat acne, it shows the positive result in a few people. In the other cases, it worsens the acne breakout reactions. A small amount of coconut oil is safe for pregnant and breastfeeding women. Our article has shown you the best uses and benefits of coconut oil on skin issues on face, body, and hands. This magic oil is beneficial for not only your skin but also your health. 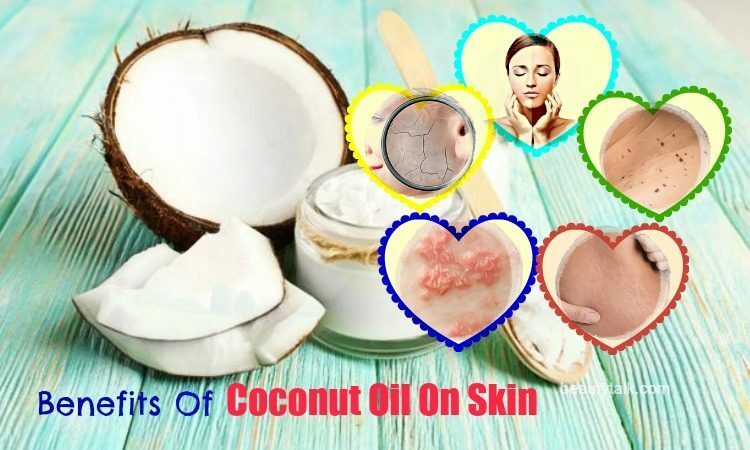 The additional information about coconut oil and other superfoods for beauty issues is presented in Foods For Beauty page of Beauty Talk site, so check out to know more. If you know any different ways to use coconut oil for skin issues, please leave your comments under this article. All content provided is for informational and educational purposes. We recommend you consult a healthcare professional to determine which method is appropriate for you.